Abit IT7-MAX2 v2.0 PCSTATS Review - What is the final word on the IT7 MAX2 Rev2? What is the final word on the IT7 MAX2 Rev2? Tell us what you thought of this review! Did we miss something, or omit your favorite benchmark? Did the review tell you what you wanted to know about this motherboard? Email your comments to the Editor here. If you're looking for the ultimate i845PE motherboard look no further then the Abit IT7 MAX2 Rev2. Performance of the the motherboard was quite good, but that's pretty much a given when you're dealing with an i845PE based board. If you are into overclocking, the IT7 MAX2 Rev2 is really built with you in mind. With stock cooling the board we tested was able to push a Pentium4 1.6A to 178 MHz FSB. With a retail price of $250 CDN ($165 US) the Abit IT7 MAX2 Rev2 is easily the most expensive i845PE motherboard on the market right now, and is geared towards the high-end crowd who scoff at things like printer ports with contempt. If your idea of a Pentium4 mobo is one which is well rounded, well equipped, and you don't mind paying for it, the IT7 MAX2 Rev2 is certainly a nice fit. Lastly if you're a performance enthusiast/overclocker, the IT7 MAX2 Rev2 is one of the best overclocking boards on the market to date. High end performance has never been cheap and if you want the best you're certainly going to pay for it! In terms of features, the IT7 MAX2 Rev2 puts up stiff competition; this board has Serial ATA, an included IDE to Serial ATA adapter, Ultra/133 IDE RAID, ten USB 2.0 ports, three IEEE 1394's, 10/100 LAN, 5.1 audio and even a Port 80 diagnostics card. Other goodies include no less than five fan headers and a set of on board power and reset switches. The layout of the motherboard is very good as well, the main IDE, floppy and ATX power connectors are all located in their ideal spots. 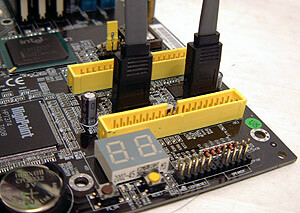 You can still install memory into the DIMM slots even if you're using a longer videocard like a GeForce4 Ti4600. There isn't much to complain about the IT7 MAX2 Rev2, I would have liked to see a better on board audio solution since this is Abit's "flagship" Pentium 4 motherboard. Something like the C-Media's 8738 would have been more appropriate then the CPU sucking AC'97 codec in my opinion. Other then that the board is near perfect. If you're looking to buy a top of the line Pentium 4 motherboard right now, the Abit IT7 MAX2 Rev2 will certainly keep you happy. Heck I bought one myself and it hasn't let me down yet. If you're just thinking about upgrading, perhaps you'd be best served to wait for a Springdale/Canterwood based iteration of the IT7 which Abit will almost certainly produce when the time is right. Pg 8. — What is the final word on the IT7 MAX2 Rev2?